Today is Goru Puja, Govardhan Puja, Mha Puja and Nepal Sambat. Govardhan Puja is performed by making a hill called govardhan parbat using Cow dung. Cow dung has big importance in Hindu culture. In the olden days it was used for everything from light at night (Methane) to polish mud floors of traditional houses. Even now no Puja is complete without cow dung in Nepali Hindu culture. It is believed that once there was a drought in a village in Vridavan. The villagers were very worried and they wanted to perform a big Puja in honour of Lord Indra, the God of rain. But Lord Krishna convinced them that, they should not pray to Lord Indra since it was the Mount Govardhan that brought the rain and not Lord Indra. This made Lord Indra very angry and in his wrath he sent forth a big thunderstorm to flood the village. Lord Krishan lifted the Mount Govardhan as an umbrella above the village to protect the villagers and their cattle from the rain and flood. 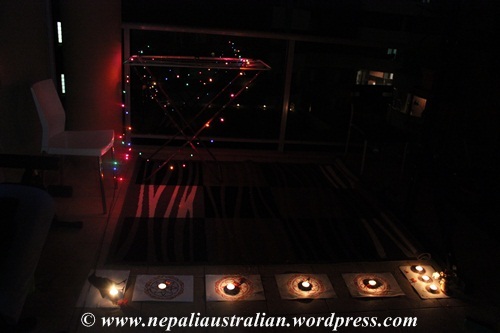 In this day, after sunset Newar community perform Mha Puja. “Mha” means body in the Newari language so on this day the Newa people worship their body and their inner self in the evening. They believe that the soul never dies and our body is only a vehicle and so we need to understand and respect our body as it is the chosen vehicle for this incarnation. This Puja is believed to bring prosperity and physical well-being. Members of the family, first males followed by females, sit cross-legged in a row. The elder group of females plays the role of facilitators for each member. A mandap, decorated with different colours and various grains, fruits and flowers, is drawn for each member of the family. In between the grains and fruits lies a mini mandap of oil, which represents the human soul. The human soul is placed between various grains and fruits so that a person will prosper throughout the year since each object represents a particular God and it is believed that each deity will bless the person. An oil lamp with velvet cloth wick equal in length to one’s own face is lit on top of the mandap facing all four cardinal directions so that a person will be renowned in all the places of this earth. Apart from worshipping oneself, all the household entities like brooms, water pots, utensils and machines are also worshipped in the same way. 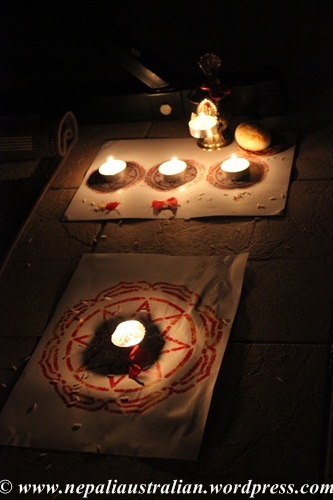 I performed Mha Puja with my brother and his family this year. This year my cousins are in Nepal so there were only 4 of us unlike 9 last year. For the Puja, first the floor was purified by sprinkling water on it then we made mandaps in front of a row of seats on the floor where we were sitting. 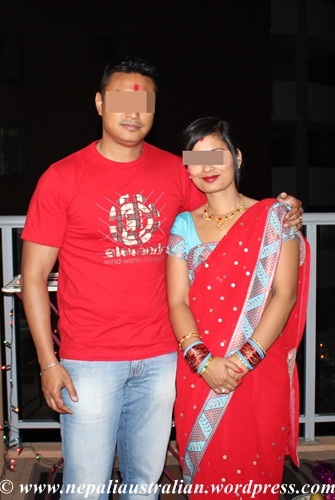 Our mandap was designed by AS and I had printed them out on A4 paper but in Nepal they are made by hand on the floor using oil, rice flour, vermilion, puffed rice and sometimes beans. The number of the mandaps needed is three plus the number of people doing the puja. We need three smaller mandaps at the top of the row for the Family Deity (Kuladevata), Yamaraj and Janmaraj, one mandap for each of the member performing Mha Puja. Then at the end of the row, we had a crow drawn symbolising Yama the God of death. First I gave Nasala, a few drops of water, in the palm of the right hand of everyone to sprinkle some into the mouth and rest over the body for purification. 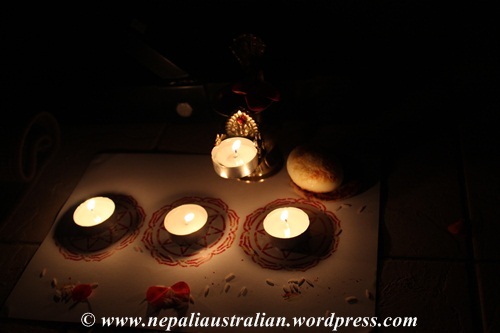 Normally in Nepal, they use Itaa (hand woven long strands made using white cloth soaked in mustard oil) but here we used tea light candle instead. 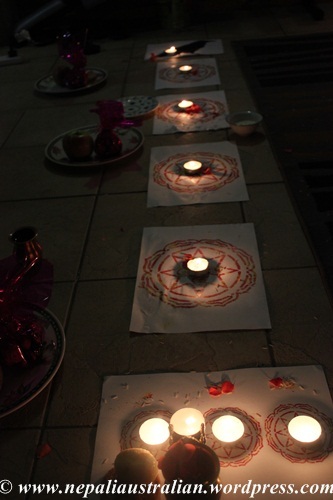 I gave each person the candle and everyone took the candle from my hand, lighted them and put them on their mandap. This light is believed to brighten the inner self and keep evil at bay. 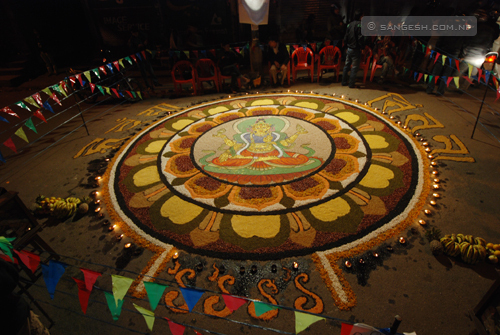 I used rice and flower to shower each individual and worshipped the god within. Then I gave every a plate with roti, sweets, fruits and masala. Then,I gave Sagun to everyone. 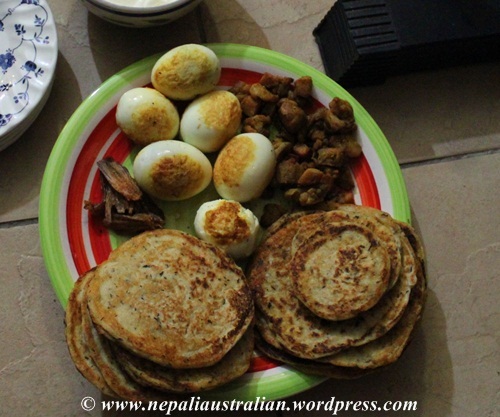 For Sagun, you put a plate of egg, bara (lentil cake), meat (chicken), a piece of garlicand fish in the right hand and yougurt in your left hand. Once everyone finished eating the sagun, we used kucho (broom) to sweep the mandaps from top of the row to the bottom touching each mandap to conclude Mha puja. 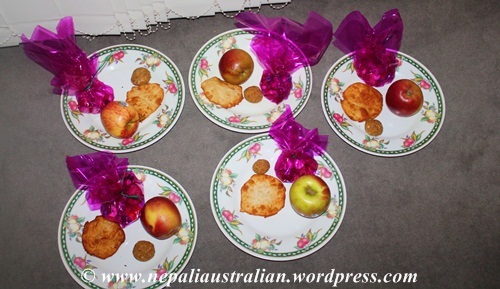 This day is also New Year’s day for Newar community and is called Nepal Sambat. 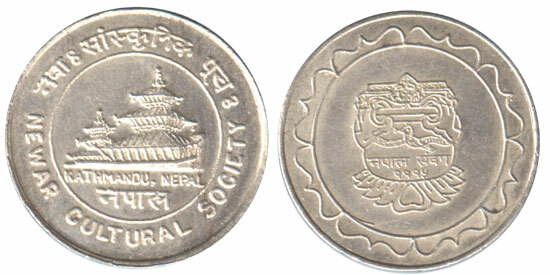 Nepal Sambat is the national lunar calendar of Nepal. The era started on 20 October 879 AD and was in widespread use for all daily purposes until the beginning of the 20th century. It appeared on coins, stone and copper plate inscriptions, royal decrees, chronicles, Hindu and Buddhist manuscripts, legal documents and correspondence. 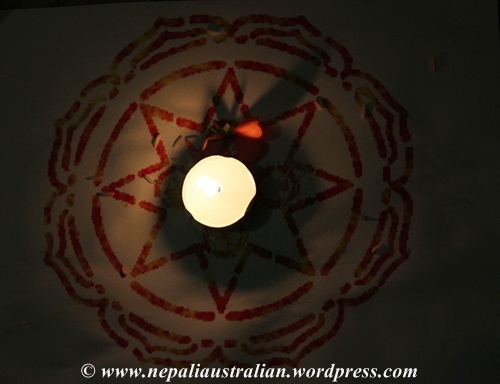 The customs of celebrating Nepal Sambat started from October 880 AD. According to a popular legend, there used to be a learned person in Bhaktapur who ordered porters to get sand from Lakhu Tirtha, a river in Kathmandu because he knew that it would turn into a heap of gold the next day. A person named Shankhadhar Sakhwaa came to know about it, and he enticed the porters to leave the sand in his place. The next day, the sand turned into gold and with that gold he paid off the debt of all the people in the Kathmandu Valley. So from that day, people started celebrating it as their New Year to commemorate their happiness. Even today, people are very enthusiastic to welcome the New Year. Every year, the day starts with a rally and the greeting of “Nhu Daya Bhintuna!” which means “Happy New Year”. Different programmes and functions are also organised in the Kathmandu Valley every year on this day. It is Nepal Sambat 1133 this year. Nhu Daya Bhintuna everyone!!! Also from this day, boys in groups go door to door singing special songs called Deusi similar to the Bhailo sung during Laxmi Puja. You can write just about any Deusi song as long as each line ends with the word `Deusi’ or `Deosuray’. A group of males get together, carry what-ever musical instruments they have or can play, and sing Deusi door to door blessing the home and family in return for money and/or refreshments. 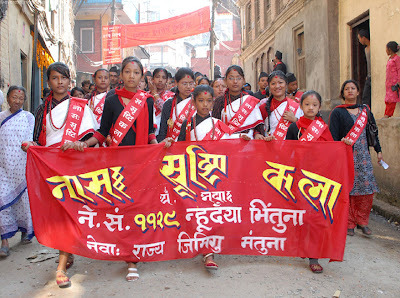 Teenagers perform various Deusi songs to collect money for their picnic. It is considered auspicious to have these groups come to your front door. 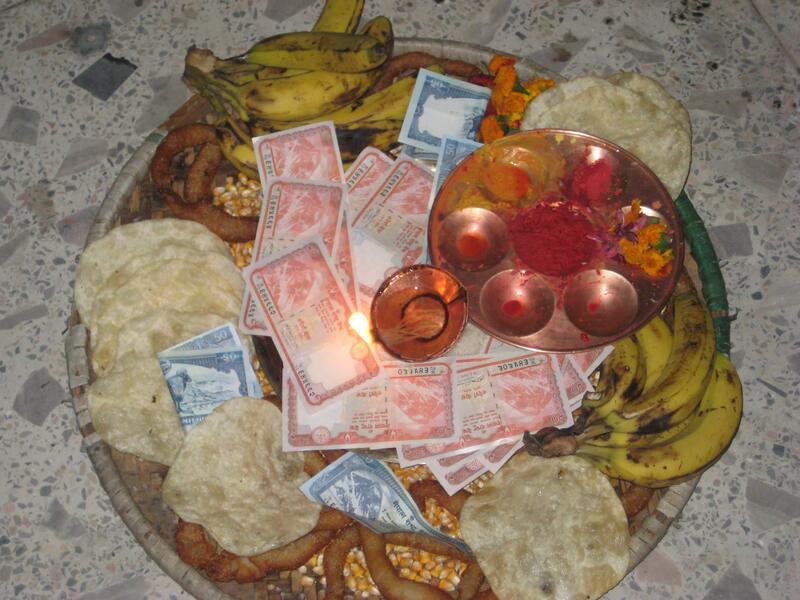 The house owner will offer them some rotis, fruits and money and they sing Deusi songs blessing the household with good fortune. 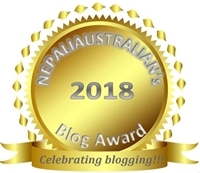 This entry was posted in Nepal, Nepali Festivals and tagged Bhailo, Deusi, Goru Puja, Govardhan, Govardhan Puja, Ita, Janmaraj, kucho, Kuladevata, Lord Indra, Lord Krishna, Mandap, Mha, Mha Puja, nasala, Nepal Sambat, Newa, Sagun, tika, Vridavan, yama, Yamaraj. Bookmark the permalink. Fascinating, as always – but I’m especially curious about the family deity. How do you know who it is? Or how is it determined? The name of family deity is passed on from generation to generation. When one gets married, she follows her husband’s family deity. Do most in the country participate and follow the traditions? Is participation remaining constant with new generations? Aaa Deusri bhailo 🙂 I remember last Tihar ko utsav ma me and A sat listening to deusi bhailo on youtube and he explained the whole process, shared memories of Tihar spent in Sikkim and tales from those times. I actually like the Deusi bhailo. Mum tells me that in Sri Lanka too they sing something called “Ashtak geet” on Sinhalese New year and these kids who sing it infront of everyone’s house and get money from the people of each house.